This book is nuch too short, which is the only thing I have againt it. Short, pithy chapters, full of wisdom and wit and always with a little twist that moves you deeply and makes you reflect back about your own experiene. Take for example the hilariously funny and so poignant chapter about Becker’s mother. At the age of 87, sufferring from Parkinson’s disease and living in an assisted-living facility, she meets a younger, 84-year-old wrack of a man and they happily get married. Ms Becker dubs him G.I. Joe, because he had served in the Korean War. He makes serious plans to take his bride out of the facility after the wedding and move in with his daughter-in-law. Sadly, that was not to be, becuase G.I. Joe died of a broken heart – “he wanted his manhood and independence back so badly” (p. 35). Or take the “Shoes Again” chapter, which develops from what seems to be a frivolous, girlish preoccupation with footwear into a major lesson in human relationship, in fact leading to the most significant relationship of Ms Becker’s life, with her future second husband. “I am a woman, and therefore, I am defined by my footwear. How do I know? Because once, when I started a new job, a whole year and three months passed before a colleague spoke to me, and the first words she ever said to me were, ‘Oh, what cute shoes! '” Everything they say about the book in rhe reviews is spot on. But it’s much more than enjoyable, it is also a hugely satisfying book. Read it with close attention and you will get a lot of good tips for your own life changes. We do hope to hear more o Jacqueline Becker in the future. AVAILABLE NOW ON AMAZON.COM OR AMAZON PRIME!!!!!!! http://www.amazon.com Search for Raging Against Aging. “Extra deep toe box for those hammertoes,” the salesman said, holding up a quilted black patent leather walking shoe. “Extra cushioning for the pad, steel support for the arches and metatarsals,” he added winking. “Try them on?” he sort of asked, sort of led. We were supposed to feel like we were in our twenties, romantically intertwined with no obligations. We were supposed to hold hands and walk around the city aimlessly, mindlessly. We were supposed to drink in the energy all around us while losing ourselves looking into each other’s eyes. Oh, we did walk around but we had to make so many pit stops along the way that we changed our route to be near the Starbucks and McDonalds. We never made it to Riverside Park. Instead we stuck close to Broadway on the Upper West Side. Broadway is utilitarian and dirty with its fair share of the homeless. It was supposed to be a glorious four days, sunny, warmish with just a hint of the fall to come. But our first day turns cloudy and windy with a hint of the coming autumn. We are in the autumn of our lives. We found ourselves directly across the street from Harry’s, the mecca for people with problematic feet. We were not holding hands. The store had restrooms and we both have difficulty finding shoes that fit us comfortably. I dragged my husband in. He went to the bathroom and I began to look for shoes. “Do you have anything else?” I practically begged. Years ago, I lost sensation first in my toes, then in my feet, then in my legs. The doctors call it “idiopathic neuropathy,” or cause unknown. Was this salesman reading my mind? I put the shoes on. “In Germany, these would be considered medical shoes,” the salesman ends his sales pitch. A voice deep inside me says: In Germany, they did experiments on my people. I hope these shoes are not a product of Mengele’s “scientific” research. I look down. The shoes do not look so bad. They are sort of cute in an odd way. And I think they can become a conversation piece. And besides what choice do I really have? They are the only shoes that really fit me. I go searching for my husband. I find him on the other side of the store, with his own salesman, trying on supportive sneakers and comfortably wide dress shoes. The kind you cannot find on the internet. I walk back and to my surprise, the salesman is sporting two more boxes. He holds up the same shoes that is on my foot – one in brown leather and one in brown nubuck. I swallow my pride and take the nubucks, too. We meet up at the cash register. The bill comes to $1100.00 and change. My husband nods but reminds me that we need the shoes. I breathe deeply and together, we decide to have the extra pairs sent home because this is our twenty-fifth anniversary and we are here for four days. 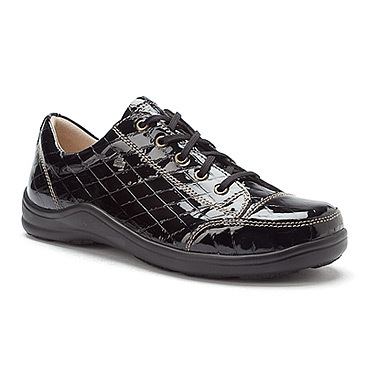 I walk out wearing my German black patent quilted walking shoes. They are extremely comfortable and help me feel more balanced. But they are a little heavy and they seem to weigh me down. Maybe I should have gotten some jewelry instead. We walk to a local restaurant that serves healthy type foods. My husband cannot have any salt. I watch the carbs. I cannot eat dairy. My husband has to hydrate. I drink bottled water. My husband has high cholesterol. I watch what he eats. At night, the mocha colored walls seem darker. The one window in the living room of our hotel suite, looks small because of the heavy curtains that drape it on both sides. The lights are too dim. We are surprised to find champagne on ice on the entrance table – a gift from hotel management. We are too tired to drink and put it in the fridge for the next day. I take off my shoes and socks. My feet are naked and exposed. My toes are twisted like bent twigs. They are really, really ugly. When did this happen? The Cialis commercial is shot in the desert. Maybe we should have gone to Scottsdale or Santa Fe. We are so tired, we decide to shower in the morning. My husband falls asleep just like that. I get out of bed. We could have gone to Paris, Montreal, Chicago, Austin, Toronto. We wanted to come to Manhattan.